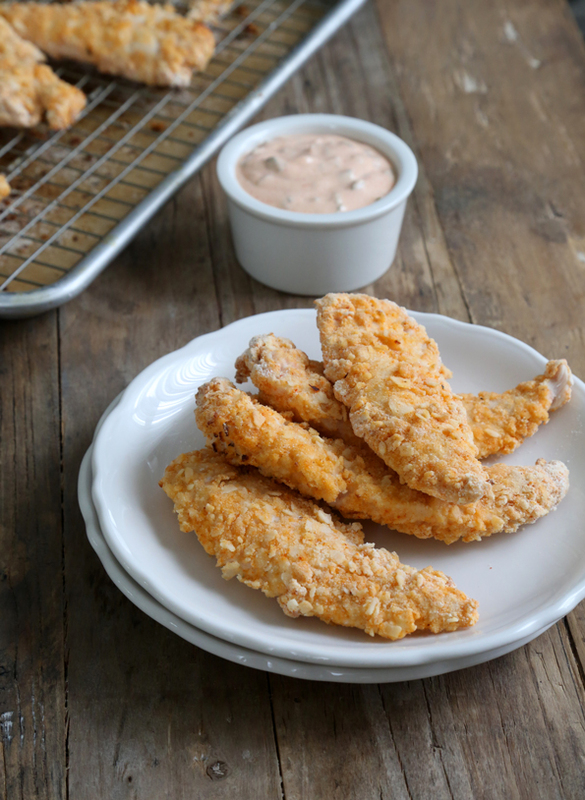 Gluten Free Crispy Buttermilk Coconut Chicken Fingers | Great gluten free recipes for every occasion. Were you wondering what to make for dinner tonight? I bet you’re looking for something that will make your hungry family happy but still make you smile, knowing that you gave them something good to eat that didn’t take forever. Yeah, me too. 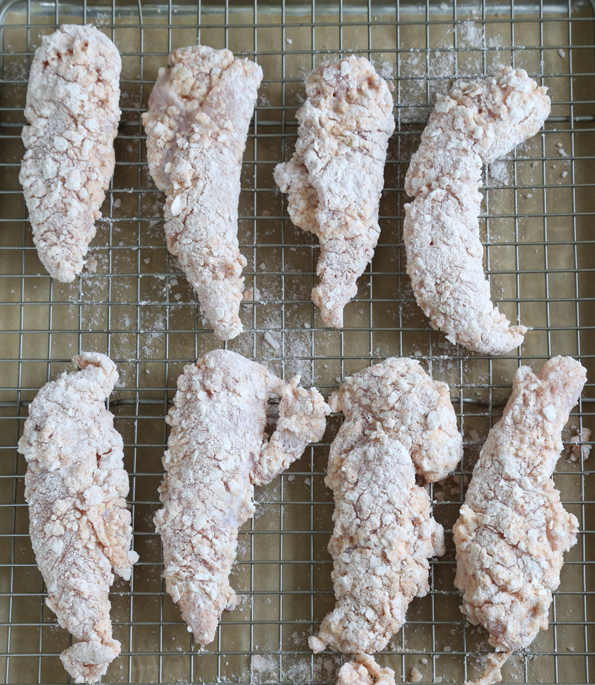 Welcome to the gluten free crispy buttermilk coconut chicken fingers that my family had for dinner last night. I have to admit that I usually just make chicken fingers or nuggets like this, and it’s delicious. But this time I decided to take your advice and go the extra crispy chicken finger route and, well, you’re really smart. And pretty. I was kind of scared to use my favorite wire racks for baking chicken, since I was convinced that they would be hopelessly covered in cooking oil and batter forever and ever. But it worked a treat—and cleaned up super easy. So what I’m saying is … I did, and I’ll do it again and again! Don’t forget the dipping sauce. It mostly just an easy thousand island dressing, but made even better with plain yogurt. And remember—even though this goes in the oven, it’s a cooking recipe, not a baking recipe. It’s not an exact science, and if you stick with the flour blend base and keep the method as-is, you can pretty much customize it to your liking. Swap out the toasted crushed coconut for, say, flax meal (nutritious!). Or toasted crushed almonds. Like your chicken fingers super salty? Add more! You get the idea. This one’s yours for the substituting. Enjoy it, ’cause that doesn’t happen too often around here! First, marinate the chicken. Place the chicken tenders and the buttermilk in a gallon-size zip-top plastic bag, and place in the refrigerator to soak for at least 30 minutes and up to overnight. While the chicken is soaking, preheat your oven to 300°F. Place the coconut flakes in an even layer on a rimmed baking sheet, and place in the center of the preheated oven. Bake until the coconut flakes are just beginning to brown around the edges (about 8 minutes). Remove from the oven and allow to cool briefly before crushing with your hands into small bits. Place the coconut in a medium-size, flat bowl, and add the flour blend, cornmeal, paprika, salt and black pepper, and mix to combine well. Increase the oven temperature to 400°F. Line a large rimmed baking sheet with unbleached parchment paper, and place a wire rack on top. If your wire rack is not nonstick, spray it lightly with cooking oil to grease. Remove each piece of chicken from the buttermilk, one at a time, and allow to drain briefly before dredging both sides through the flour blend. Place on the wire rack about 1 inch apart from one another. Spray the top of each piece of chicken lightly with cooking oil, and place in the center of the 400°F oven. Bake for 10 minutes. Remove from the oven, flip the pieces of chicken over, spray each again lightly with cooking oil and return to the oven to continue baking until crispy on both sides and cooked through (about another 10 minutes). 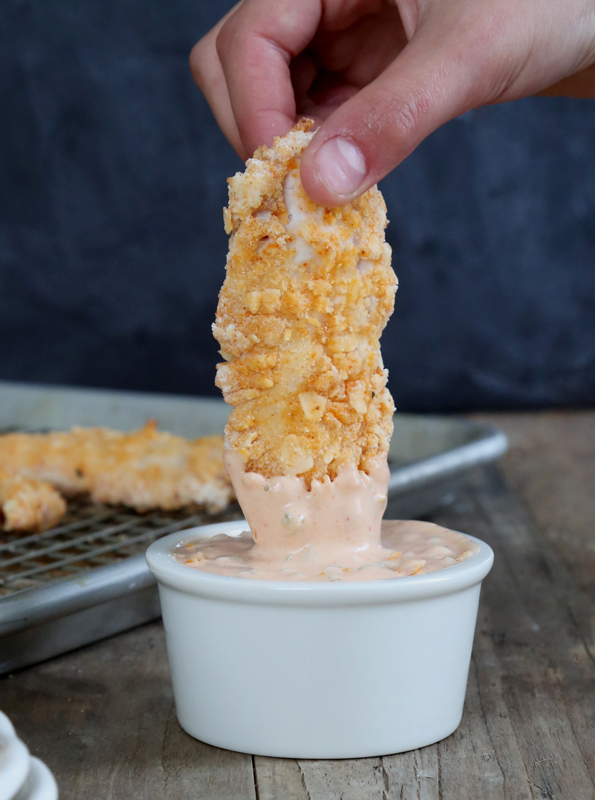 While the chicken is cooking, make the Thousand Island Dipping Sauce. In a medium-size bowl, place the yogurt, mayonnaise, ketchup, salt and paprika, and whisk vigorously until smooth. Add the chopped cornichons, and mix to combine. Serve the chicken with the dipping sauce. Adapted heavily from How Sweet Eats as chosen by YOU from my Must Make Gluten Free Pinterest Board. 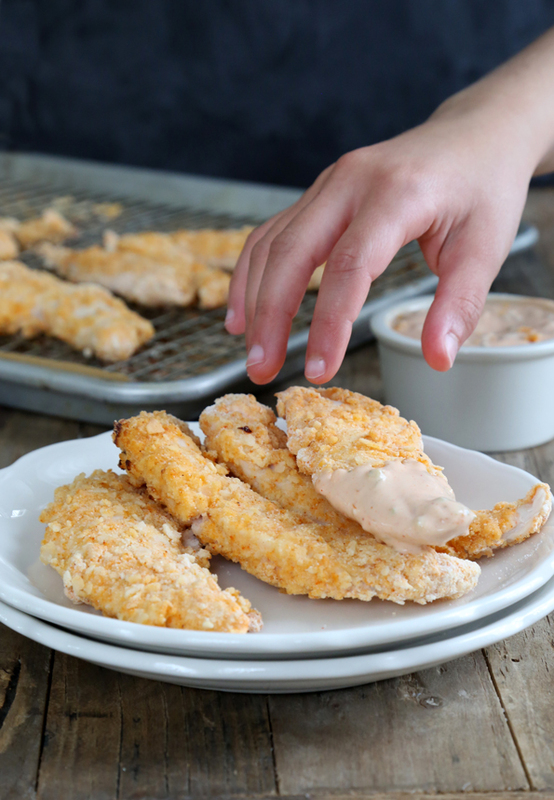 I just saw these chicken fingers on a menu and thought I’d never know what a delicious combo I am convinced chicken and coconut must be and then BAM I came to your blog and there’s a recipe for the very meal I thought I’d never get to try! I swear you can read minds!!! Late to this party because of work! I hate when work gets in my way of checking out this blog! YUM – 5 thumbs up on this one Ms. Nicole! Here is an FYI for you: my husband made dinner once because I was working late. We were having chicken cutlets. He used my bread flour to dredge the chicken in prior to dredging into corn meal/Kashi Simply Maize GF cereal mix. It wasn’t bad…it got eaten by all…but he is now aware of where the King Arthur is in the pantry. LOL! Last time I mixed GF flour and corn flour for dredging. That was good! Why does the flour have to be xanthan gum free flour ? Coconut tenders also taste well with Honey Mustard. I had gotten out chicken to thaw for strips tonight, but I have all the ingredients for this, so I guess we are going fancy! I love visiting you each morning, Nicole! You’re the next stop after email checks! I’m thinking you should be my home page…LOL! So that little Nanny cam has a speaker receiver too? I was asking my girls if they wanted chicken strips tonight? You are soo talented you read my mind! Thanks for the lovely recipe! Have a great day! HUGS! Nummers! this do look gorgeous! Thanks for a great recipe – this will work well on any holiday table this weekend!! !